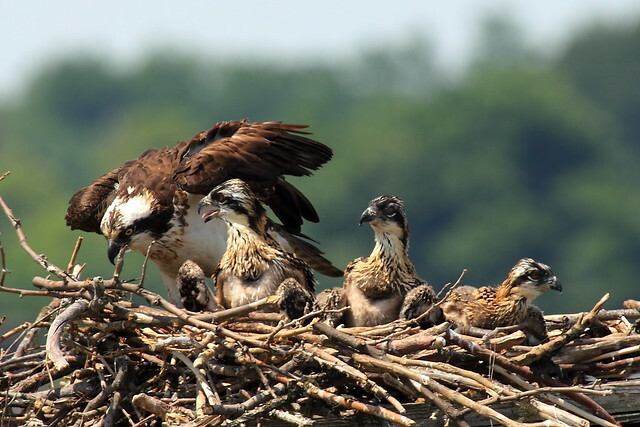 Osprey Chicks in Nest | Flickr - Photo Sharing! Osprey (Pandion haliaetus) tending to her three chicks in the nest at the Belle Haven Marina. PSA: If you're a boater, please give them a wide berth. Looks like you got some great shots of the ospreys! Very cool! Can't wait to go while the sun is out, for once. Wow, very nice shot, great detail. Awesome shot!! I need to get over there to see them this season. In your growing collection of terrific bird photos, this is one of the best. I just gasped with wonderment - you've outdone yourself here, my friend! Thanks! The light was particularly good that day.